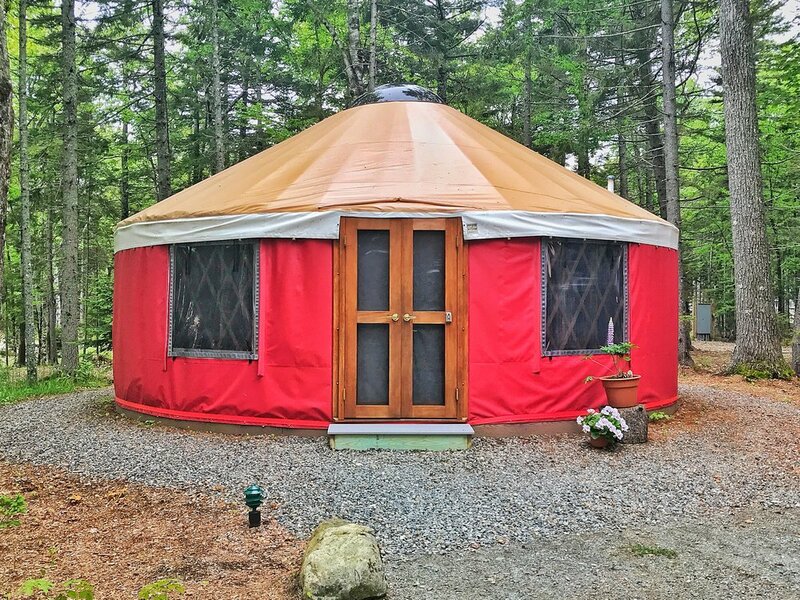 This yurt sleeps up to 6 people, comes stocked with all the essentials and features an enclosed bedroom with queen bed, a lofted bedroom with a queen sized bed, a queen size sleeper couch, a large kitchen with range, dishwasher and stand up refrigerator, a heat and A/C unit, sink, cookware and dishware. There is also a full bathroom with stand up shower. Each of these yurts can sleep up to 4, comes stocked with all the essentials and features a queen bed, a queen size sleeper sofa, an apartment size kitchenette with 3/4 refrigerator, apartment size stove/oven, A/C unit, sink, cookware and dishware. There is a full bathroom with stand up shower. Have you seen the Tiny House TV shows? Thinking of building one? Love Tiny living? Come stay with us in one of our 2 custom built, self contained Tiny Homes. Each unique unit features a small kitchen, stand up shower & flushing toilet and comes stocked with all the essentials.